When Google introduced Jelly Bean (Android 4.1) at Google I/O this past summer, the most popular new feature was Google Now, by a landslide. Google Now, combined with Search, turned your phone into an automated and incredibly intelligent tool. There were the beautiful cards for weather, sports, travel, and appointments, plus the knowledge graph displayed in a crystal clear way. With Google Now on your phone, you instantly became the best trivia night cheater in the building. But how can you access it? With a stock device like the Galaxy Nexus or Nexus 7, you can quickly access Google Now from the lockscreen. But what if you are in the browser or gallery and want to see an updated sports score? Easy, as long as you have a device with on-screen navigation keys that runs Jelly Bean. 1. Press the Home button and swipe up onto your home screen. 2. That’s it. No, seriously. Enjoy Google Now. This can be done from any screen. If done slowly enough, you’ll see that as you swipe up, your finger leaves some sort of a fingerprint trail as it moves towards the Google Now button. There is no better way to access Google Now, than this. This will also work with the RAZR HD and RAZR M when they receive Jelly Bean. 1. Not all phones have on-screen navigation keys, so the method differs depending on the phone. 2. On other phones, long pressing the physical Home button usually does the trick. 3. Some phones like the Galaxy Note 2 require a long press of Home and then a tap on a Google icon. 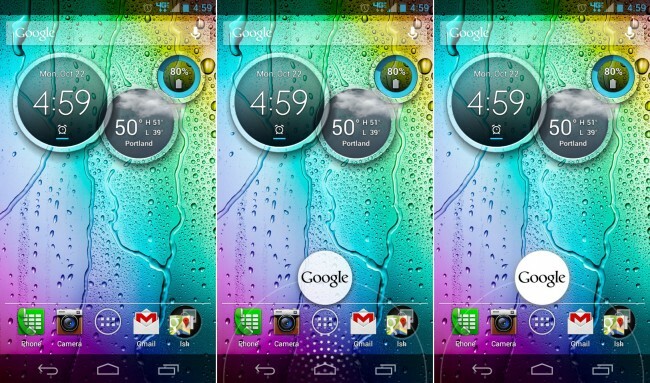 DROID Bionic Ice Cream Sandwich Update Available to All!